A low drive in golf can be caused by several factors, including stance, swing plane and placing the tee too low. Among the most desirable shots to many golfers is a quality drive. However, achieving a quality drive is no easy feat. Often times, the result of a poor drive is a low, line drive type of shot that doesn't travel an optimum distance. There are numerous causes for this type of low drive off the tee box. When a golfer places too much weight on their front foot, it increases the chances of a golfer getting out front of and "stabbing" at the ball, which is likely to yield a low trajectory off the drive. However, by keeping one's weight back and leaving it there until impact position, the weight is more evenly distributed across the swing, which will help make impact with the ball on the way down, therefore increasing the chances of a longer, higher drive. Also, make sure not to swing too quickly and "lunge" at the ball, as this can create a low drive as well. Often times, a low drive is caused simply by teeing the ball up too low. A number of golfers, worried about teeing the ball up too high and hitting a high, looping drive, tee the ball up just off the ground. This, however, can yield a low drive, as it can cause a golfer to "top" the ball, thereby lining it off the tee and not getting much air time. 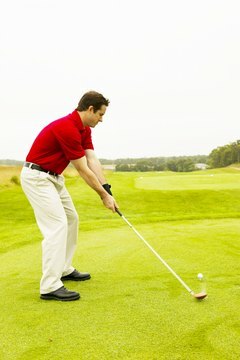 One of the primary causes for a low drive is hitches in a golfer's swing. For instance, a short backswing usually causes a low drive, as this type of swing limits the actions of the wrist, which help sustain a high, arcing drive. In cases where the wind is low and driving, this is an optimal swing. However, in picturesque weather conditions, a short backswing can deter a golfer from striking a long, arcing tee shot off the tee box. Let the hands and wrists have some movement during a backswing, as this will help further the chances of preventing a short, line drive off the tee box. "Golf" Magazine: Tee It High or Low? What Is a Penetrating Ball Flight?